Public telephones are available in all major cities in Romania. They are located on streets, in parks, and in doorways of institutions. The post office also has telephones whereby the customer simply pays an attendant after making the call. 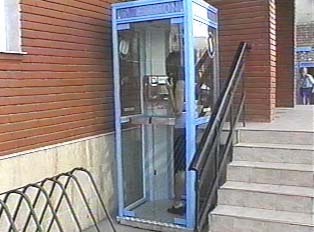 There are also public pay phones; blue phones accept only coins and orange phones accept phone cards. Phone cards may be purchased either at the post office or at newspaper kiosks for 50.000 and 100.000 lei. The length of the calls varies according to the zone price per minute. The distance determines the cost of the calls for both phone card and coin calls. To use a pay phone, lift the receiver, insert either coins or a pre-purchased phone card, and wait for the tone. The number of unused units left on the card will appear in the window of the phone. Basic instructions will also appear in Romanian and English. Dial the desired number following the instructions. When finished, hang up the receiver and retrieve the phone card. "Calling a Friend for Tutoring Help"
"How to Use a Phone Card"
"May I speak with Mr. Director Vasile Ionescu?"